METTLER TOLEDO's world leading expertise in metrology extends to test weights, weight sets and weight calibration services. The weight portfolio covers weights according to OIML or ASTM from fifty micrograms to five tons in all accuracy classes. Our test weights are used all over the world, not only for testing balances but also as primary standards in mass laboratories. The proprietary electrolytic polishing process for knob and wire weights in the upper class range eliminates microscopic protrusions in the weight’s surface which is far smoother compared to mechanical polishing. Thanks to the enhanced properties of the passive oxide film, long-term stability of the test weight is improved. Choose from a comprehensive selection of test weights and related calibration services. We offer weights and services of the highest quality – even for users with limited budget. Building on many years of experience and customer feedback, our weight boxes and accessories have an unmatched reputation. Profit from short recalibration times and trustworthy services with our global network of accredited mass laboratories. Test your balances securely, and in accordance with USP <41>, by using just two test weights to test at 5% and 100% of the capacity of each balance. Not only is this unique approach much faster, but purchasing and recalibration costs are substantially reduced. CarePacs® include tweezers, gloves and other accessories for professional weight handling. The unique weight identification system "WeightLink™" works with the balance firmware to cross-check the weight against its calibration certificate, making it impossible to test using the wrong weight. With weight parameters transferred electronically to the balance, the system guarantees full traceability thus data integrity is given. What are calibration weights for scales? Weights are predominantly needed for adjustment and testing of balances and scales. In metrological terminology, a distinction is made between mass standards and certified weights National regulations and international recommendations define the error limits of certified weights. Weights are classified into tolerance limits which are defined either by OIML or ASTM. The conventional weight value and not the mass is used as the nominal value of the weight. For a high level of accuracy, certified weights are calibrated and traceable back to the IPK (International Prototype Kilogram). What are OIML and ASTM calibration weight classes? Weight classes are separated according to the error limits that are classified either according to OIML or ASTM declarations. Class E1 weights intended to ensure traceability between national mass standards (with values derived from the IPK) and weights of class E2 and lower (i.e. F1, F2 ...). Class E1 weights or weight sets shall be accompanied by a calibration certificate. Class E2 weights intended for use in the initial verification of class F1 weights and for use with weighing instruments of accuracy class I. Class E2 weights or weight sets shall always be accompanied by a calibration certificate. They may be used as class E1 weights if they comply with the requirements for surface roughness and magnetic susceptibility and magnetization for class E1 weights and their calibration certificate gives the appropriate data. Class F1 weights intended for use in the initial verification of class F2 weights and for use with weighing instruments of accuracy class I and class II. Class F2 weights intended for use in the initial verification of class M1 and possibly class M2 weights. Also intended for use in important commercial transactions (e.g. precious metals and stones) on weighing instruments of accuracy class II. Class M1 weights intended for use in the initial verification of class M2 weights and for use with weighing instruments of accuracy class III. Class M2 weights intended for use in the initial verification of class M3 weights and for use in general commercial transactions and with weighing instruments of accuracy class III. Class M3 weights intended for use with weighing instruments of accuracy class IIII. The error in a weight used for the verification of a weighing instrument shall not exceed one third of the Maximum Permissible Error for an instrument. These values are listed in section 3.7.1 of OIML International Recommendation 76 Non-automatic Weighing Instruments (1992). ASTM Class 0: used as primary reference standards for calibrating other reference standards and weights. ASTM Class 1: can be used as a reference standard in calibrating other weights and is appropriate for calibrating high-precision analytical balances with a readability as low as 0.1mg to 0.01mg. ASTM Class 2: appropriate for calibrating high-precision top loading balances with a readability as low as 0.01g to 0.001g. ASTM Class 3: appropriate for calibrating balances with moderate precision, with a readability as low as 0.1g to 0.01g. ASTM Class 4: for calibration of semi-analytical balances and for student use. NIST Class F: primarily used to test commercial weighing devices by state and local weights-and-measures officials, device installers and service technicians. Why should you use certified calibration weights? ASTM Class 0, Ultra Class, and OIML Class E1 should be used for the highest level of precision i.e. mass standards (calibrating other weights), micro-balances testing and calibration, and critical weighing applications. ASTM Class 1, 2 and OIML Class E2, F1 should be used for precision applications i.e. analytical balance testing and calibration. ASTM Class 3, 4 and OIML Class F1, F2 are best suited to Top Loading Balance calibrations and testing, and moderate precision applications (laboratory non-critical). Note: if a balance or scale is calibrated, the weight set used and the class must be documented. 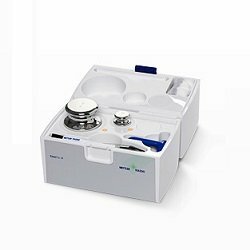 How to use a calibration weight set for routine balance testing? For routine testing, specially-designed CarePacs are recommended and the nominal value should suffice for most process requirements. The tests to be carried out depend on the criticality of the weighing process, i.e. arisk assessment. SOPs are available for test practices. 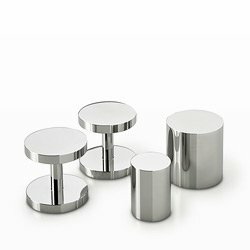 What are the benefits of using stainless steel weights? Stainless steel weights have long-term stability. 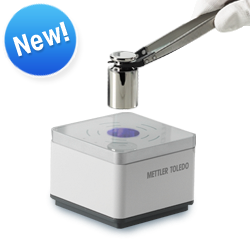 All Mettler Toledo weights are made of premium stainless steel to make them corrosion resistant. Monobloc weights are specially designed for long-term stability and weights with an adjusting cavity provide the best value for money. Electrolytic polishing ensures glossy surfaces for anti-adhesion effects. 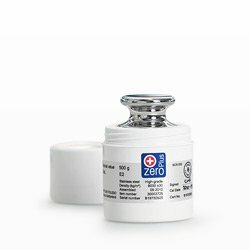 Microgram weights were made available by Mettler Toledo in response to increasing customer demands for values below one milligram. Weights are packaged with specially- designed accessory sets and handling tools to provide a complete solution for operators who go beyond traditional boundaries. These weights are also traceable and therefore have certified values which are necessary for critical applications such as nanotechnology applications. Download the white paper on Micro Weights to lear more. Traceability of weights used for testing must reference the weight set number and the certificate supplied with the weights will provide traceable calibration data. Care should be taken not to mix up weight sets as traditional weights are not marked. 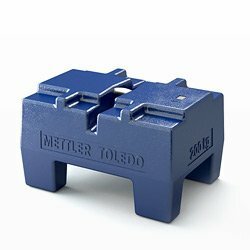 Mettler Toledo has responded to these challenges by laser printing dot matrix codes on weights and also making available special readers for identifying the weights. The digital “WeightLink” solution allows all calibration data to be integrated into the dot matrix code. Why is a silicon sphere used for specialized volume measurement? Why a sphere?Spheres are used as the volume can be determined according to the definition of volume by a length measurement. Why silicon? Silicon spheres (Si) have the same homogenous atomic structure as a perfect diamond, without voids or dislocations, so the density is more accurate than other materials. This is why a silicon sphere with a homogenous atomic structure serves as a reference for specialized volume measurement. What are heavy capacity weights used for? Mass comparators go up to six tons' capacity. Industrial scales go up to several hundred tons. Heavy capacity weights typically in the range of 200kg, 500kg, 1t and 2t are used for sensitivity, eccentricity, linearity and repeatability of these higher-capacity devices. Weights are less than 2t due to the maximum lifting capability of machines, typically forklifts and cranes. However, these weights can be combined to reach the desired weight. Professional weights like MT's have lifting hooks and areas where weights can be lifted by a forklift. Barrel (round weights) are illegal as they roll and could injure a service technician. Heavy capacity weights must be transported in heavy-duty trucks and it is important to ensure trucks do not exceed their rated load limit due to safety and government regulations. Heavy capacity weights are generally constructed of cast iron not stainless steel due to the cost. METTLER TOLEDO's world leading expertise in metrology extends to weights, weight sets and weight calibration services. The weight portfolio covers OIML weights from fifty micrograms to five tons in all accuracy classes. Our weights are used all over the world, not only for testing balances but also as primary standards in mass laboratories. For our weights, we source only the finest quality austenitic steel which offers the highest resistance to corrosion over the course of a weight’s lifetime. Our unique manufacturing process involves melting the steel under vacuum, traditional mechanical polishing, final stage electrolytic polishing, fully automated cleaning processes and final calibration using state-of-the-art mass comparators. The process has been perfected over years of experience to bring you accurate weights of the highest quality, with a stability that remains unmatched in the market. Weights are the most frequently used and most important equipment for testing scales and balances. And as such, need to be handled with care. You should not clean weights with certain chemicals; and more. Simply register below to download your free copy of "Correct Weight Handling—12 Practical Tips"
This white paper will be of interest to anyone responsible for testing and maintenance of weighing equipment, in industries where strictly regulated conditions prevail, such as the pharmaceutical, biotechnology, chemical and food industries; and anyone who is highly concerned with the recording of process data. METTLER TOLEDO’s ISO/IEC 17025 calibration lab in Naenikon lab is celebrating 25 years of excellence, ensuring clients capture accuracy today—and maintain accuracy tomorrow..
Download the white paper "Traceability with Microgram Weights"